By Meredith Disharoon, D.O., Dale H. Lee, D.O. 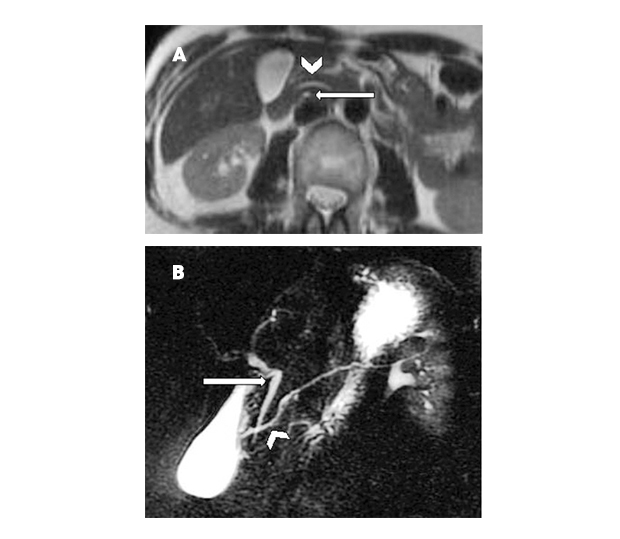 A 47-year-old woman presented with recurrent abdominal pain and was referred for an MRI examination. Axial T2 MR image (A) demonstrates the dorsal pancreatic duct (arrow head) crossing anterior to the common bile duct (arrow) at the level of the pancreatic head without direct communication. MR cholangiopancreatography (MRCP) coronal source image (B) shows the dorsal pancreatic duct (arrowhead) crossing the common bile duct (arrow) and terminating at the minor papilla. Imaging findings are compatible with pancreatic divisum. Pancreatic divisum (PD) occurs when the dorsal and ventral portions of the pancreas fail to fuse in early gestation. In classic PD, the ventral duct drains the pancreatic head and uncinate through the major papilla, while the dorsal duct separately drains the majority of the pancreatic secretions of the body and tail through the minor papilla. This configuration is suspected to predispose patients to ineffective emptying of the dorsal duct, triggering recurrent bouts of pancreatitis. Although PD is often asymptomatic, the classic clinical presentation is recurrent pancreatitis in a young patient. MRCP is noninvasive with a high sensitivity and specificity for the detection of PD. Secretin can be administered with MRCP to dynamically evaluate the exocrine function of the pancreas, improving image quality and accuracy in diagnosis. Patients can be treated medically; however, sphincteroplasty of the minor papilla may be required. Manfredi R, Costamagna G, Brizi MG, et al. Pancreas divisum and “Santorinicele”: diagnosis with dynamic MR cholangiopancreatography with secretin stimulation. Radiology 2000;217(2):403-408. Disharoon M, Lee, DH. At the Viewbox: Pancreatic Divisum. J Am Osteopath Coll Radiol. 2016;5(2):29. Meredith Disharoon, D.O., Dale H. Lee, D.O.